Discourse Hub received an update to 1.4.0 yesterday and it now says this when trying to access community.rachio.com. I am on iOS 12.1. Thanks for the heads up @scorp508! Having the team (cough @franz) take a look today! What is a discourse hub? Hah! Discourse’s one-stop app for viewing multiple Discourse forums with integrated notifications of replies/etc. No need to manually visit each site via mobile browser like some ancient rotary phone user. Reply from our discourse service provider. Are you able to test this on a different device? How are you adding it? Are you entering “community.rachio.com” just like that (without the quotes) ? Yes, entering it exactly like that. This the same as Tapatalk? I used to use that for my forums, but not all are/were on there. Yup, and specific to the forum software used here. Looks like the discourse team is on it. We are now able to reproduce it (first we were not for some reason). We are investigating and I will keep you posted. We have raised this issue with the Discourse team and they have provided a fix. 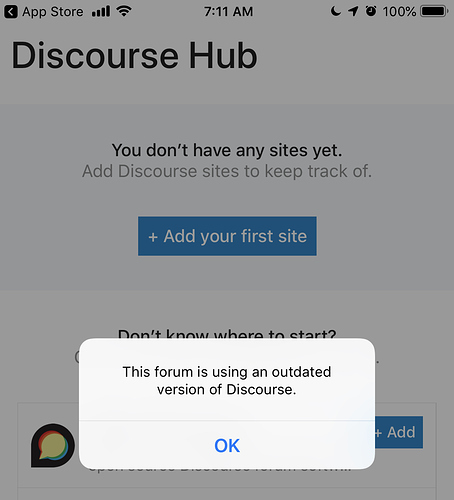 We have applied the fix and your forum is working again with the latest Discourse iOS app.